A recent collaborative study by investigators at Children's Hospital Los Angeles (CHLA), Brigham and Women's Hospital, and the California Department of Public Health has suggested that all infants with a known mutation for cystic fibrosis (CF) and a secondary mutation called the 5T allele, should receive additional screening so as to predict better the risk of developing CF later in life. The results from this new study—“Phenotypes of California CF Newborn Screen-Positive Children with CFTR 5T Allele by TG Repeat Length”—were published recently in Genetic Testing and Molecular Biomarkers, a Mary Ann Liebert, Inc., publication. The research team found that adding specific DNA sequencing to current newborn screenings would allow for early diagnosis in ethnically diverse populations and may increase the number of CF diagnoses in the U.S. over time. Moreover, such determinations could result in earlier treatment of CF—ultimately improving the outcomes and prolonging the lives of a children diagnosed with the disease. While each state uses a different screening algorithm to detect newborns with CF, California has implemented a unique algorithm which incorporates full sequencing of the gene responsible for CF, called the CF Transmembrane Conductance Regulator or CFTR. Most other states perform a two-tier screen using the patient's blood that first measures the concentration of the pancreatic enzyme that is elevated in CF. In babies with the highest levels of this enzyme, called immunoreactive trypsinogen (IRT), a secondary screen looks at a selected list of 23 to 140 CFTR mutations known to cause the disease. 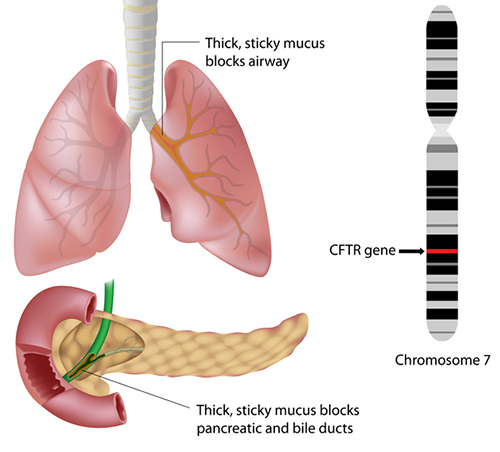 Additionally, over the past several years the use of next-generation sequencing has increased the number of researchers studying the disease to more quickly and accurately identify genetic variations in the CFTR gene that lead to CF phenotypes. Unfortunately, many of the currently employed CFTR mutation panels were created based on the most prevalent mutations in severely affected individuals, most of whom were Caucasians. In California, after detection of one CFTR mutation, blood samples are sent for CFTR-DNA sequencing to rule out the presence of a second pathogenic mutation. Remarkably, California has screened more than 4 million newborns for CF since 2007, discovering that in babies with two mutations only about one-third had classic CF symptoms. Two-thirds of the babies with sequence variants were not found to have CF as indicated by an abnormal chloride sweat test, considered to be the gold standard for CF diagnosis. “The question became whether the babies in the second group (labeled CFTR-related metabolic syndrome or CRMS) really went on to develop CF, or if benign variants in CFTR were being detected that might never cause a clinical problem,” noted senior study author Richard Parad, M.D., a neonatologist in BWH's Department of Pediatric Newborn Medicine and an associate professor at Harvard Medical School. In the current study, the scientists investigated evaluated the effect of a particular, common mild CFTR gene variant that is carried by nearly one of 10 people, the 5T allele. They followed the cohort of babies—for eight years— detected through CF newborn screening with a variant detected in both of their CFTR gene copies: one severe CF-causing mutation and one 5T allele. The researchers were able to generate risk predictions based on the “TG repeat” – a DNA repeating pattern of varying length found directly adjacent to 5T alleles. Newborns with an 11 TG repeat showed no signs of CF during eight years of follow-up. However, six percent of babies with a 12 TG repeat developed the disease, and nearly 40 percent of children with a 13 TG were considered to have CF within eight years of birth.